I’m not sure if you have noticed, but it has been hot this summer. That is why so many eagerly awaited the splash pad. It is a refreshing addition to Laurel Park, especially if you are hot. Thus far, the park has been packed. Today, we are taking a look at the Splash Pad, frozen treats, and hot events as we reflect on this hot Conway Summer of 2018. The mayor got into the act of welcoming the Splash Pad with this video. Many of you have wondered why I haven't personally tested the new splash pad at Laurel Park. The Splash Pad opening brought KARK and THV11 to town to see the excitement. Channel 4 reporter Chanley Painter drew the wet assignment for the TV station. Looking for a way to beat the heat? 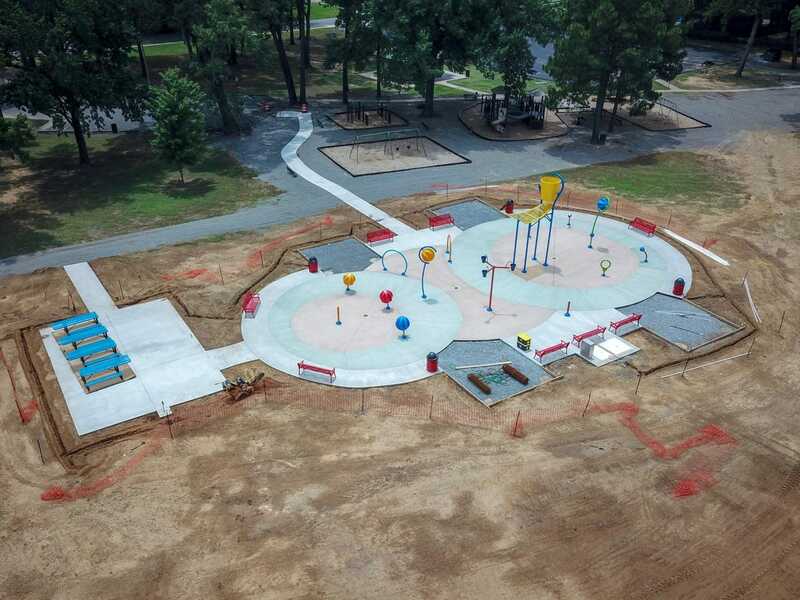 Conway's new family-friendly splash pad just opened up! It will be open from 9 a.m. to 8 p.m. Speaking of ways to beat the heat. How about frozen treats? Read on. We held a Frozen Treat challenge a couple of weeks. The winner ended up being Las Delicias. Anyone up for some ice cream? 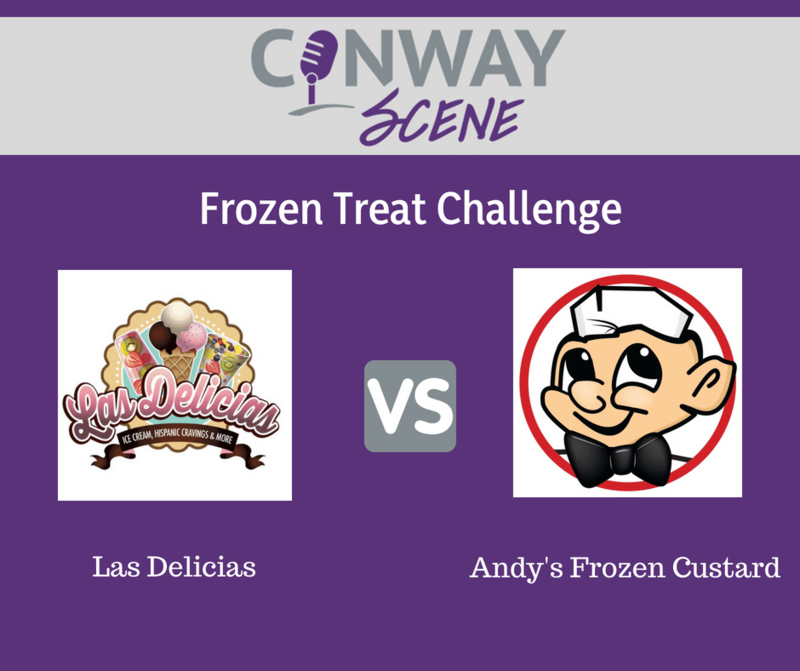 The local shop edged out Andy’s Frozen Custard in our poll at the Conway Scene Facebook Page. Speaking of frozen treats, Freddy’s Frozen Custard & Steakburgers recently opened on Oak Street, right next door to Waffle House. I was crazy enough to walk in on opening day, but I was served pretty quickly. They had all-hands-on-deck and had a good experience. 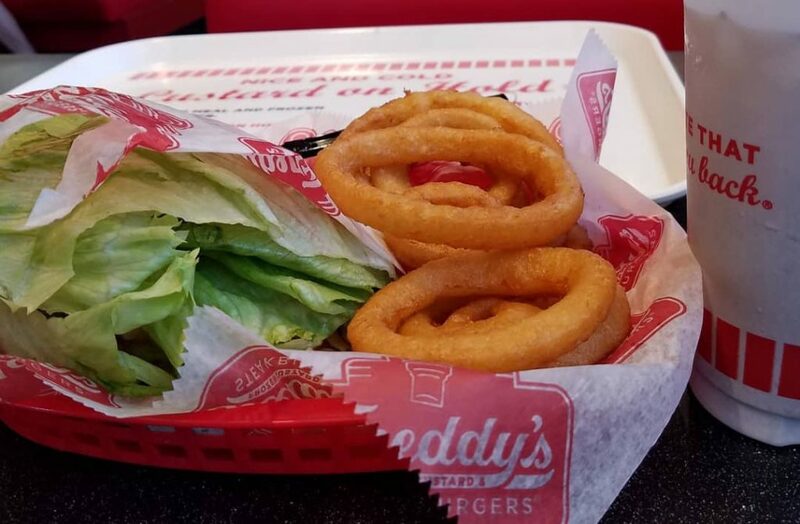 Freddy’s serves steak burgers and frozen custard. One of the managers let me try the vanilla, and it was excellent. Another new frozen treat place is Milk & Sugar Rolled Ice Cream next door to Round Mountain Coffee on Prince Street. I have never tried rolled ice cream, but it seems to be popular these days. I noticed a friend of mine visiting a rolled ice cream shop in Kansas City recently. For some time now, Roll It Frozen Cream has been wowing folks in one of their various pop-up locations around Central Arkansas. It looks like we have two options for rolled ice cream. The Studio is hot. Well, not literally. The new downtown co-working space has been serving up events since they opened in June. Recently, they held a full week of grand opening events from July 9th to July 13th. One morning they served breakfast to nonprofit leaders, and one night there was a Beats + Brews were attendees listened to vinyl records while enjoying their favorite beverage. Friday night, The Studio held their Grand Opening Party. If you are looking for a casual, inspiring, and collaborative work environment, check out The Studio. Jimmy Warren II has been busy too. He has hosted a couple of events recently. One was “Kids From the 90’s (The Freshest Adult Game Night),” a casual business networking event. The other one was called “big facts. A Conversation About Culture, Community, and Conway.” The big facts conversation event included Mayor Bart Castleberry, Conductor’s Kim Lane, and Sandstone Real Estate Executive Broker Korry Garret on a panel taking questions and addressing a room of minority and small business owners. I’ve chatted with Warren a couple times at events and he is passionate about Conway. He is buiding the momentum of collaboration. 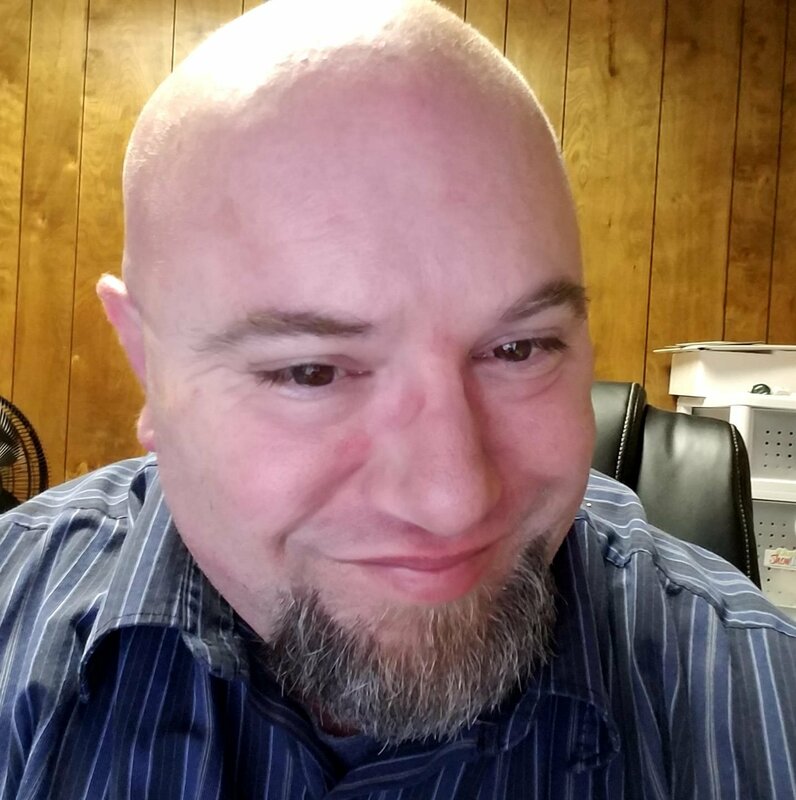 This week, July 28th, he is hosting a self defense class, “Trap Safety: An Event Focused on Self Defense,” at Gillespie Boxing. Tacos 4 Life celebrated Hunger Hero Day June 26th. They gave out free tacos to customers who dressed up like superheroes. The free tacos were to celebrate the millions of meals raised by guests at all the Tacos 4 Life locations which now include North Carolina and Texas. 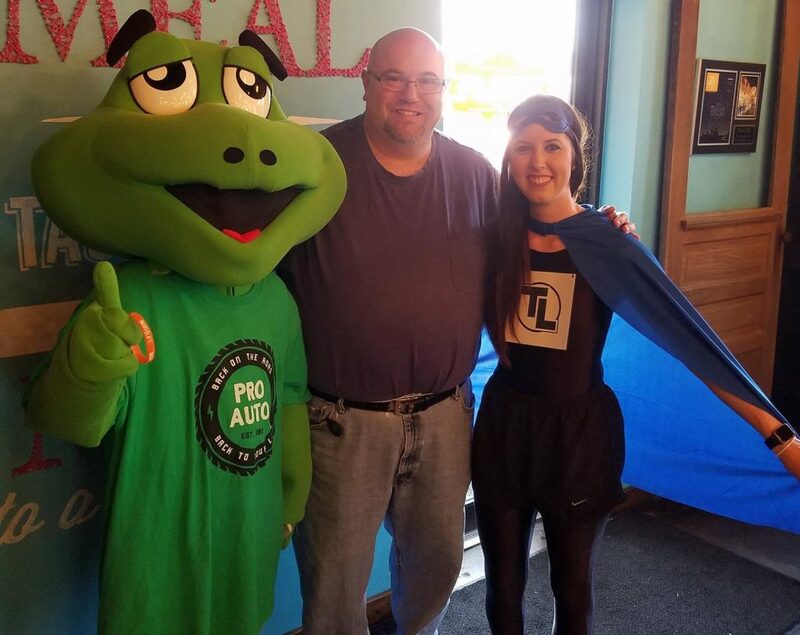 I got to hang out with Croaker of Auto and Tacos 4 Life girl at the Oak Street location. What have you been up to this Summer? What has been your favorite thing to do? What are you looking to most for the Fall?